This kitchen counter makeover was a must for 3 reasons: there’s no money in the budget for new counters, there’s nothing really wrong with the counters except I don’t like the way they look, they are in perfectly usable condition, and I detest taking perfectly useable things to our landfill site. So after thinking about it for a while I knew exactly what I wanted to do. I could picture the end result in my head but I was having trouble finding what I needed to recreate that picture in real life. Then John and I took a thrifting trip a few weeks ago and, lo and behold, he found exactly what I’d been looking for and he knew it before I did. See that large Creative Cuisine book. John found it in a small town Salvation Army thrift store, and when he first showed it to me I said it wasn’t right because it wasn’t vintage enough. This edition is from 1985. I was specifically looking for vintage cookbooks with white pages, and I was having no luck at all. And John said, and I love him dearly for it, “But the recipe headings are red, and I think they’d go with the red in the kitchen”. I was so excited!!! And I couldn’t wait to get started! What a fabulous hubby I have, if I do say so myself. 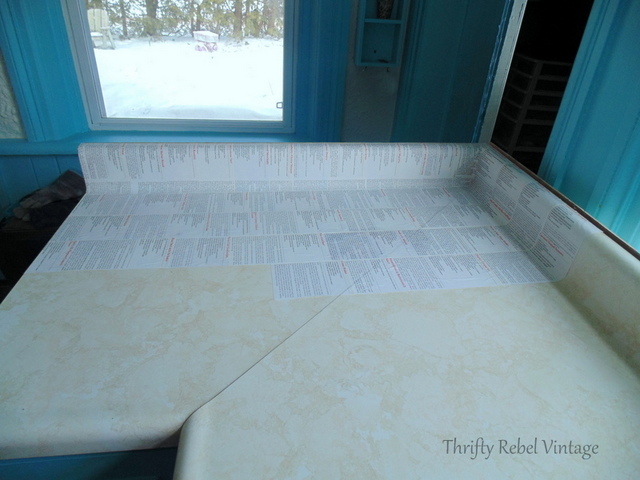 That night while watching television I cut hundreds of recipes out of that book. 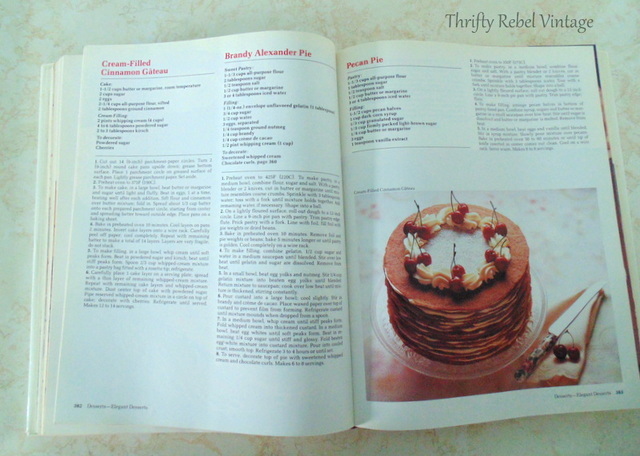 I divided the recipes by size and type such as baking and desserts, entrees, and soups and salads. I also had a pile of favourites, which would be used on top. 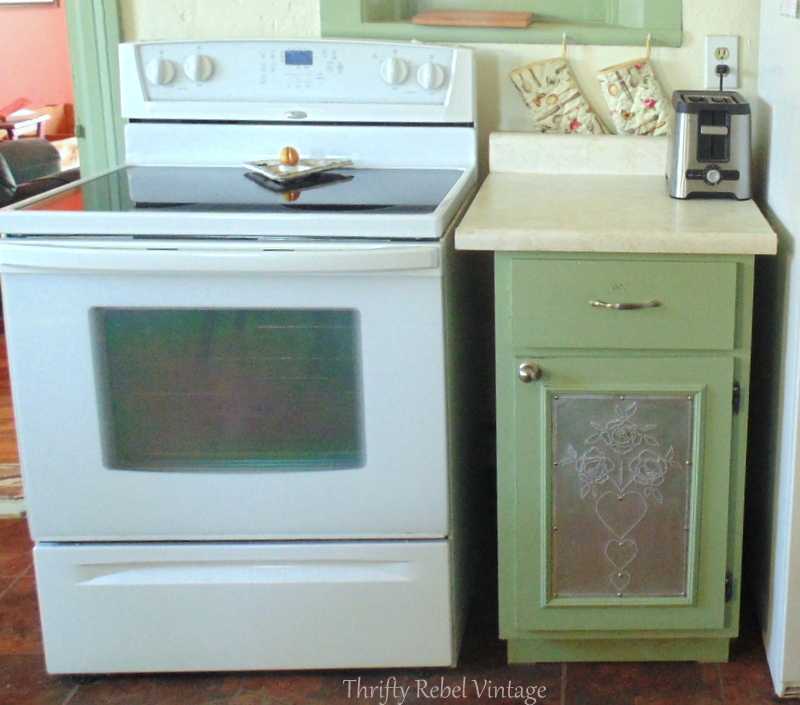 And just like when I painted the kitchen cupboards I started with the small unit between the fridge and stove. 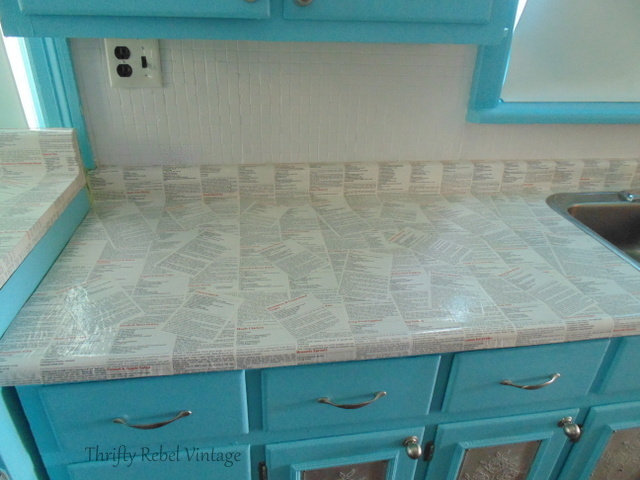 I applied some mod podge onto the counter, starting with the back. Applied some mode podge to the back of the recipes. 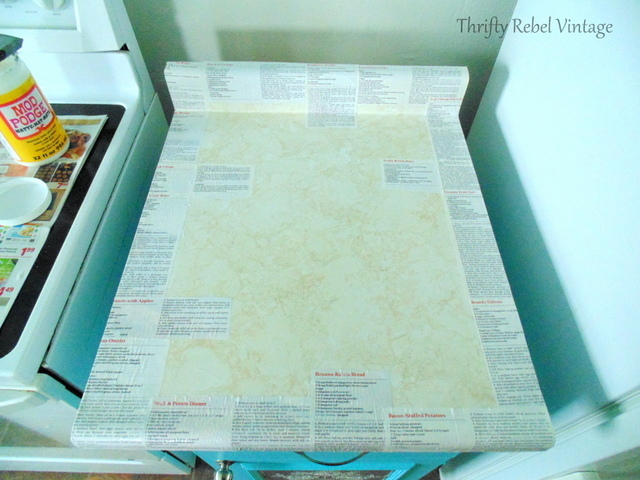 Put the recipe in place, folding down the sides or back or front (depending on what I was working on), and then applied some mod podge on top. I did the outside edges first and then worked my way in. When the base was done I applied some of my favourite recipes on angles on top just to add some interest. Looks pretty wrinkly right now, but most of the wrinkles disappeared as it dried. I did try to smooth out the recipes as best I could, as I put them down, with my fingers and with a brayer. I did a coat of mod podge all over. 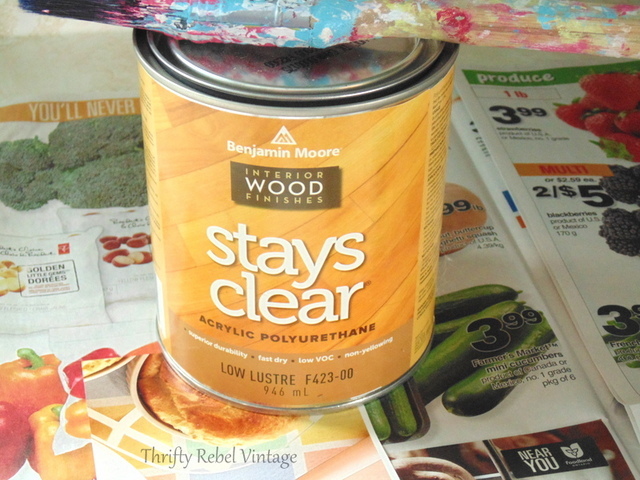 Stays Clear Polyurethane is what I usually use for these kinds of projects because it doesn’t yellow. Here’s this little counter all done. You can see how the wrinkles have disappeared, most of them anyway. There are still a few, but after four coats of the Stays Clear you really don’t notice them at all. But with 4 feline friends I can’t promise that there isn’t the odd cat hair in there though. lol. Saved for posterity. Here are some pics of the other counter areas. Here’s the large corner cupboard counter during the makeover. And after. I should have counted the recipes that I used on this. Just like on the little cupboard, I angled some favourite recipes on top for fun and if I ever want to make one of them the recipe is close at hand. Like this Finnish pudding recipe that my mother used to make when I was growing up. I just might have to make it some day myself. 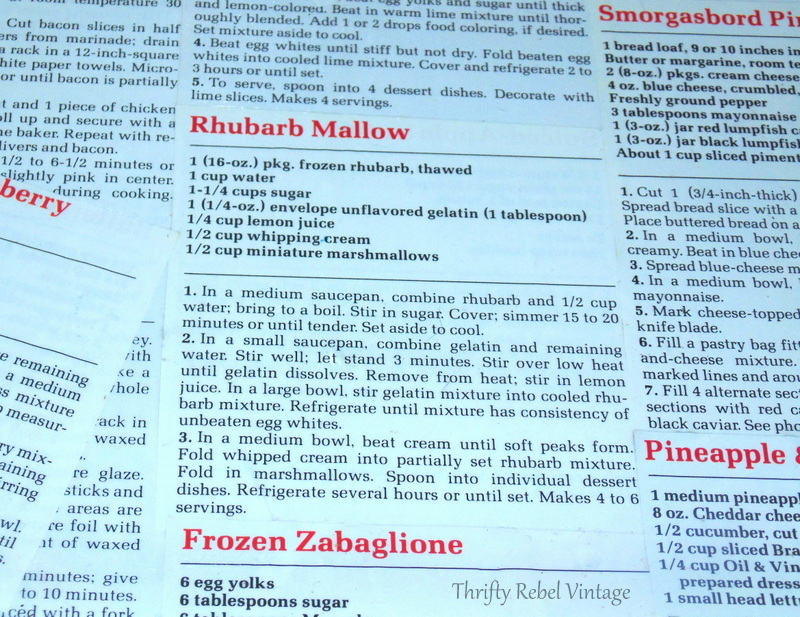 I had a reader ask me for the Rhubarb Mallow recipe that she could only see part of in the Raspberry Flummery recipe picture, so here it is. This picture was taken in October 2018, and I decoupaged my counters in February 2017 so I think they are holding up very well. Here’s one side of the main counter before. And the after, with the back splash painted white. 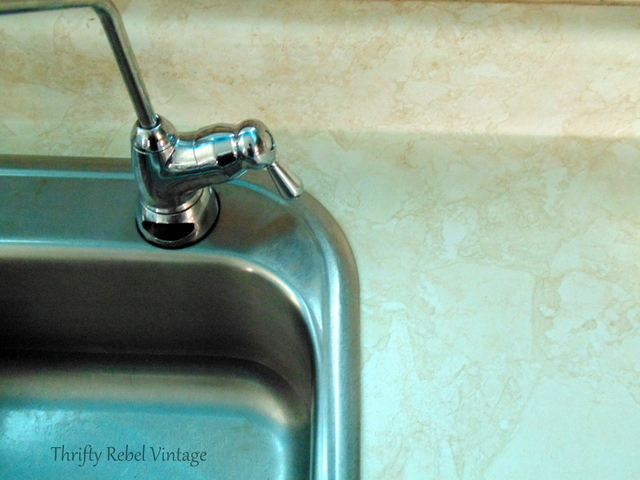 This is just the first stage of the back splash makeover, which I’ll be sharing later this week. Here’s the counter before on the other side. I’m particularly happy with how the sink area turned out. We don’t have a dishwasher, and we do the dishes by hand, so I ran a very thin bead of clear silicone waterproof caulking all around the sink to protect my counter from any water splashes that might seep underneath the sink edges and into the paper that I slid under there. 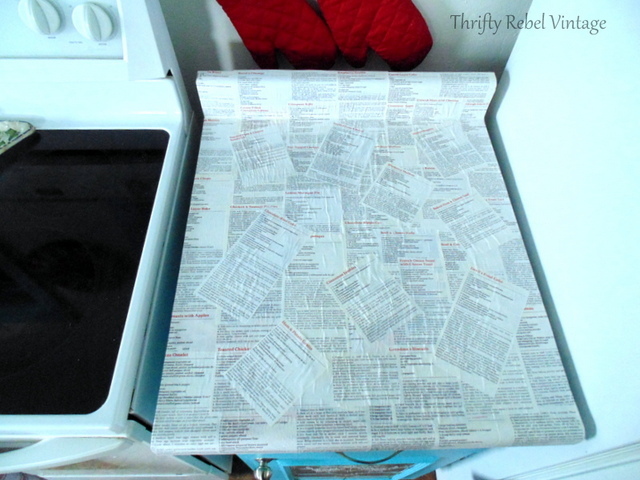 To get the paper under the sides of the sink I slid a very thin knife in to make some room and slid the recipes under. It worked like a charm. Please note: I’ve included affiliate links for products in this post. If you purchase products by clicking on one of the links I’ll receive a small commission of any sales, but it doesn’t cost you a penny more. This affiliate money helps to keep TRV going, and I thank you so much for your support. Read full disclosure here. So here’s the very green before of the small cupboard. 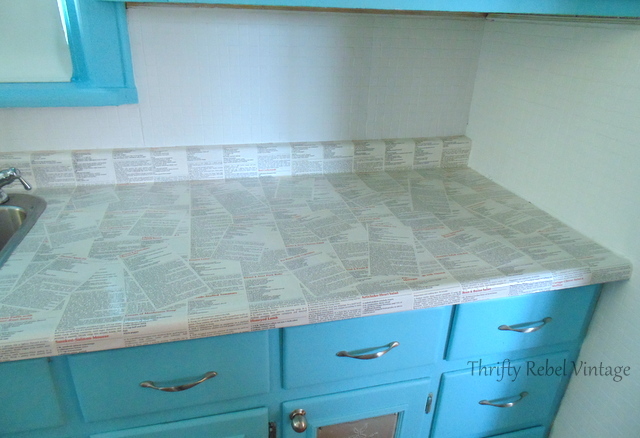 And the after with my newly decoupaged counter top. 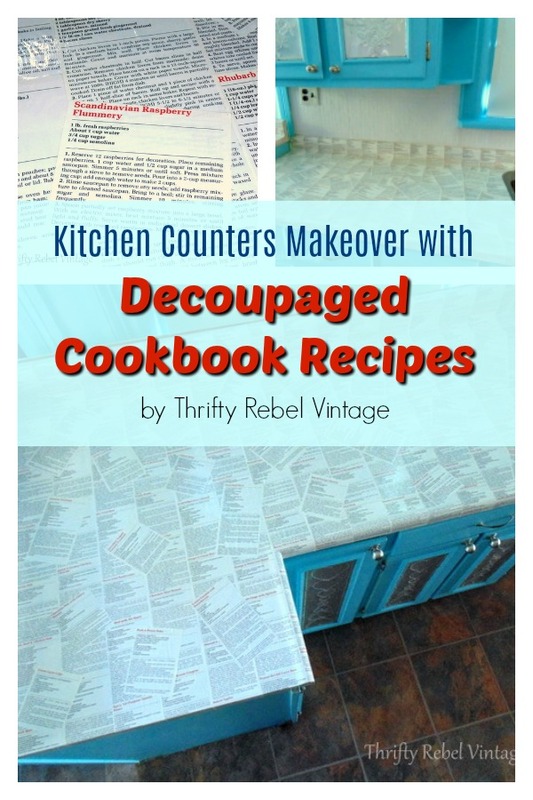 The recipe book cost $4 and I had plenty to do all the counter tops, so this was a very inexpensive makeover. I already had the mod podge and the Stays Clear. 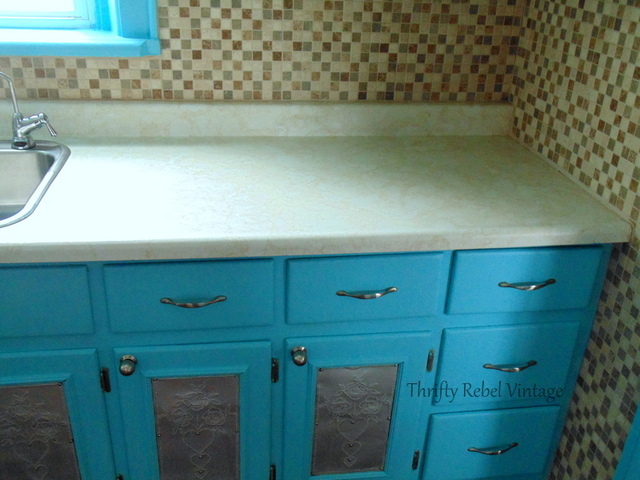 The book might not have been vintage, but my counters definitely were, and they look so much better now. It took about ten days to get all the counters done because I had to work in stages. The Stays Clear poly had to dry for 2 to 3 hours between each of the 4 coats, plus we had to be able to use the kitchen. I have no idea how long these counters will last, but a bathroom counter that I painted and polyurethaned about 10 years ago just started showing some wear recently. So I think this could work for quite some time. Of course, food should not be placed directly on these counters. Just like with any painted or poly’ed surface food safe dishes should always be used, and I also wouldn’t place hot pots and pans directly on the counters. I always use potholders or place mats. So if you need new kitchen counters, but don’t have the budget to replace them consider giving them makeover. There are so many things you could cover them with. The possibilities are really endless, and you can save a ton of money. 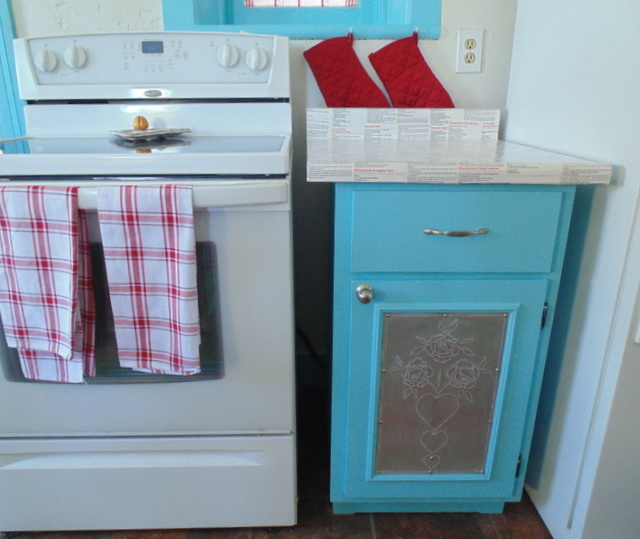 UPDATE: You can now see my completed Under $100 Aqua and Red Kitchen Makeover. Pin to your favorite board and share with your friends! Thanks very much Dona! He’s a keeper for sure! Tuula, I want to thank you for the great idea. I have a coffee/espresso area with the same counter top as the rest of my kitchen. I am going to try and find a book with all types of coffee/espresso recipes and try this. I think this is so awesome. I was going to do something like this for my bathroom floor but use the colorful funnies pages but everyone thought I was crazy. Smh. I so love this idea very much. Thank you again for sharing. Is the Stay Clear polyurethane safe to put food on? Hi Flora. For me no polyurethane is safe to put food on. I never put food on my old laminate counter tops either. 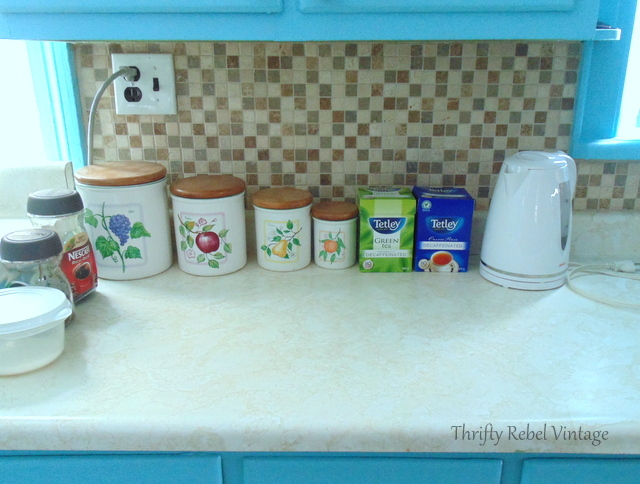 What cleaner do you use on your countertops? 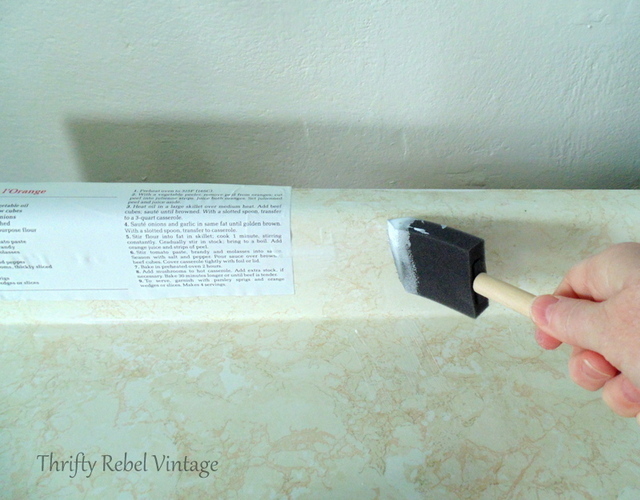 I like Mr. Clean with Febreeze–do you have any insight as to what that would do to the polyurethane top coat? 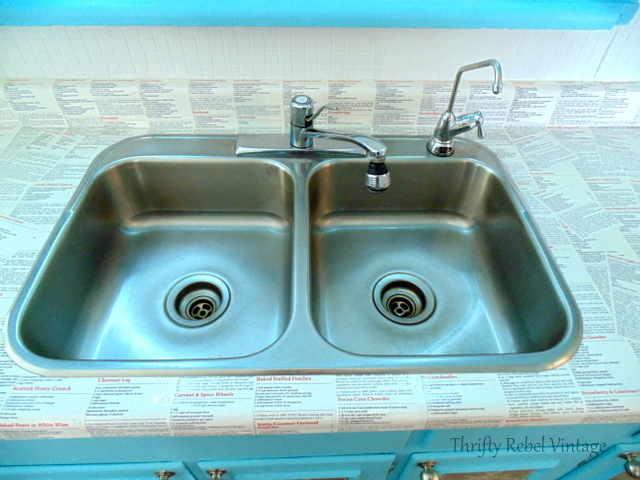 I have poly counters too and use a diluted mix of water and pine cleaner. works great if you need additional cleaning power. Two years and counters look great. once every 6 months or.so, I give them another coat of poly to smooth out any nicks etc. I would expect nothing less from you Tuula, to come up with such a creative, unique solution to old countertops! It looks great and there is just enough red in there….smart man! Love the backsplash white. I am wondering what more you could do to make it more fabulous?! Thanks AnnMarie! 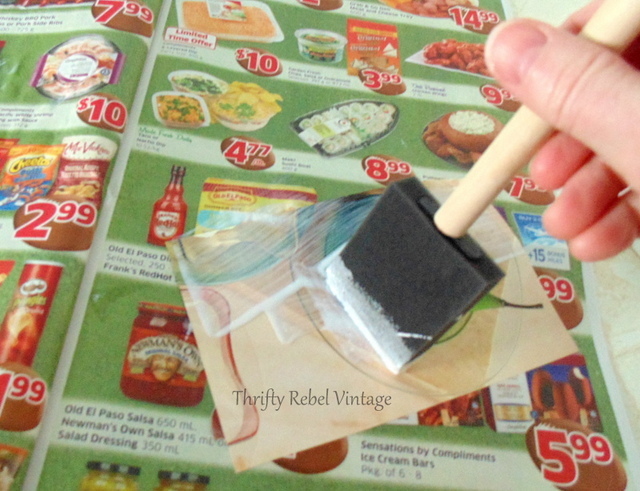 I really had to find as low cost a solution as possible for the counters and decoupageing was it. The backsplash just needed a little extra something to make it fun. I hope you’ll agree when you see it. Your countertops turned out marvelous! You continue to amaze me with your creativity! Truly Amazing Tuula! That should be your name! I really love it and hope it lasts for as long as you love it or decide to do something else with your kitchen…but I can’t imagine ever doing that! It’s a place I’d love being in, cooking in, baking in or just standing there admiring it!!!! Can’t wait for the backsplash! And thanks again for showing my gadget last week…I was able to actually make a daisy with it! Thanks so much Linda! I have to admit I find myself hanging out in the kitchen more just so I can look at them. Now that it’s done I can’t quite believe that I did it. lol. 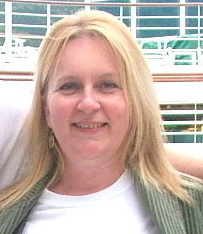 I was happy to share your mystery item and I’m so glad the mystery was solved by my readers. 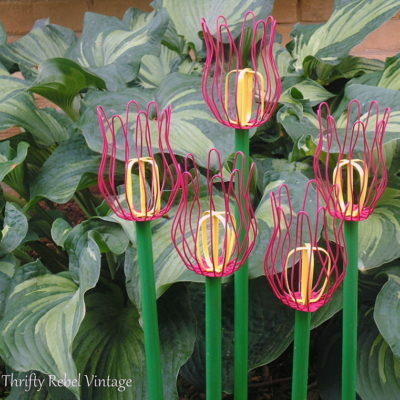 How fun that you’ve already made a daisy. This is truly amazing Tuula. Looks great. Love the color of the cabinets too. It is coming together nicely. Wow – what a great idea. Is the poly waterproof or doesn’t it matter? Tuula, what a genius idea! I’m sure you know what a smart hubby you have who is on board with your project. Love the look of the counters now & can’t wait to see the backsplash makeover. Thanks Florence! My hubby doesn’t even look at me funny when I tell him my ideas. lol. I am definitely a lucky girl. Thanks very much Julia! My thoughts exactly about the recipes. A couple of the really visible ones are chocolate related. That was no accident. lol. My hubby is definitely a keeper. Tuula that really was using your head. Our counter tops are awful. We put down tiles many years ago and the tiles came up. I have them covered with cutting boards right now. We were in IKEA last year and found $90.00 butcher blocks on sale for $9.99 each. We bought three of them but they are still sitting against the wall waiting to be installed. We have to rip out the back splash which is also in terrible condition and install the tiles I bought at Habit two years ago. Unfortunately some health issues have arisen but I plan to get them done in the next few months. I will keep this idea in the back of my head if I ever have level counter tops. What a great idea! 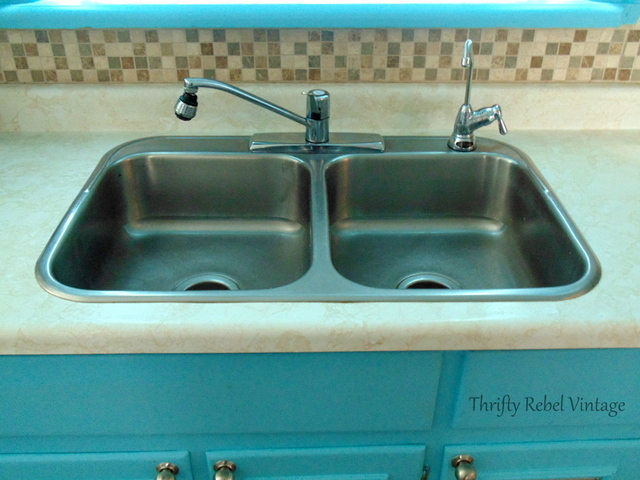 The counters really work with the beautiful blue cabinets. 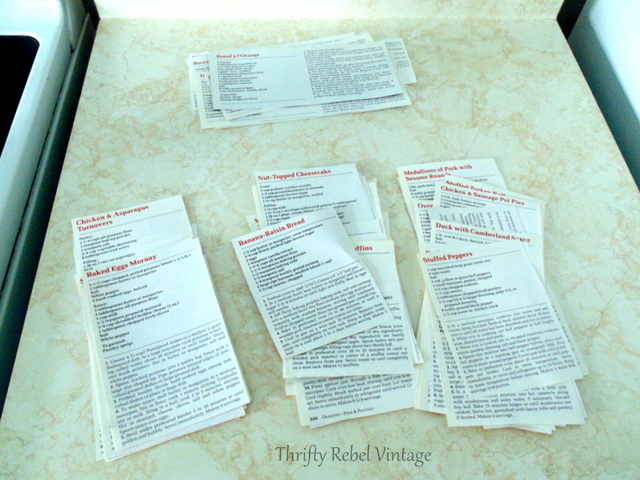 I have boxes full of old recipe cards, maybe those could be used in a similar way. Thanks Stephanie! I don’t see any reason why recipe cards wouldn’t work just as well. 🙂 You might want to test one of two with some Mod Podge on a space piece of wood to see if you like what they look like. That looks awesome tuula! I have to admit, I was skeptical when I saw that you were going to decoupage them but the result is fantastic! I could see this done in a vintage trailer too…so cute! Thanks Tania! I can certainly see that too. I actually think they turned out even better than I expected. I love it when that happens because it doesn’t happen all the time. Thanks Deb! I’m so glad you’re enjoying my blog. I just popped over and checked out your kitchen cabinet makeover and they turned out really amazing. 🙂 Mod Podge is really a saviour sometimes. Tuula this is really impressive. It was a lot of work but so worth it in the end. I love using pages to cover things. I even covered my trunk a year ago and it has held up very well. Amazing. I’m wondering how long you’ve had them and how they are holding up. Thanks Sherry! This is a very recent project. I just finished the last coat of poly this past Saturday. I will have to supply an update a few months down the road, but with 2 coats of MP and 4 coats of poly I’m pretty confident they’ll last quite a while. You cracked me with the “cat hair preserved for posterity'”. LOL! Great idea. I’m glad to see Modge Podge resurface as such a versatile medium. You CAN USE IT FOR JUST ABOUT EVERYTHING. I had a friend 30 years ago use it on an old claw foot bathtub, the outside—and it was awesome. But, there wasn’t blogging then so you didn’t take pictures of your ‘cover-up a disaster’ project. You’re so right about the sealer. It is most definitely the key. 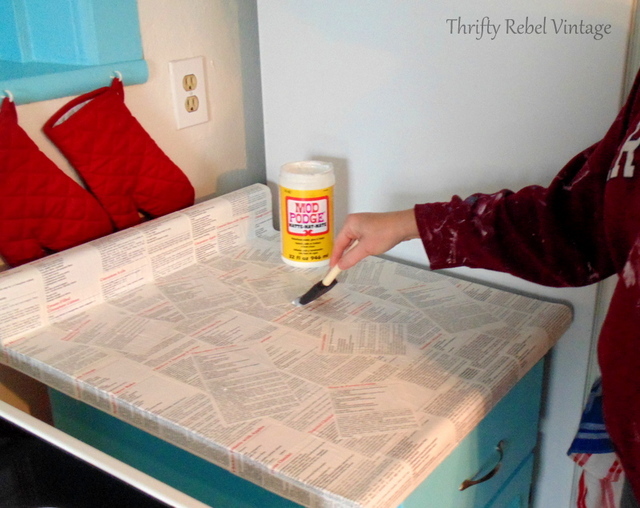 Mod Podge is the perfect cure for many decor ailments. That tub sounds amazing! I’d love to know how it lasts with use. It looks great! Thanks so much Zefi! I’ll be sure to do an update post in a couple of months. Tuula, I’ve never seen this done and I love it! Great job. Your kitchen makeover reflects your creative, happy spirit–totally you! Thanks very much Cecilia! It definitely feels like me. Wow!!! If that holds up to kitchen ware and tear, then I give you the title of “Genius”. I absolutely love the look ! It’s very unique and adds so much charm. Plus you don’t need a contractor and a lot of money . Win-win, Great job! Oh my gosh that is so fantastic! I had thought about decoupaging a couple of my grandma’s hand written recipes on to my cabinet doors… think I’ll still have to try that 🙂 We would love to have you at our To Grandma’s house we go link party – it starts every wednesday! Very cool idea! Tweeted. Visiting from Vintage Charm party. This turned out really great! 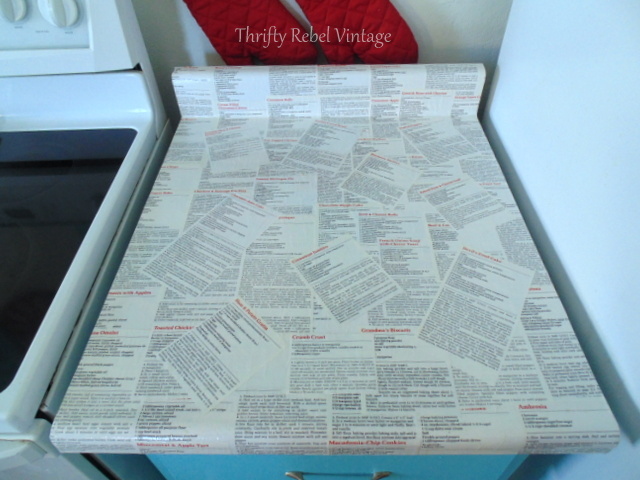 I have a weakness for using book pages alot and I even used the pages from an old Betty Crocker cookbook on the top of our kitchen island. We used the kind of two part resin used on bar tops and it has stood up really well. Your hubby’s idea of the red recipe titles is inspired! Now I’m blog snooping your great projects. Thanks Anne! 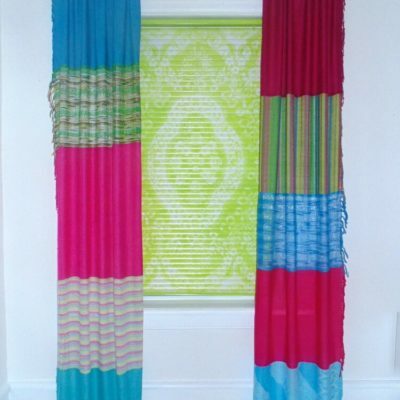 Decoupaging is so much fun, and it allows us to have custom spaces unique to our home. Snoop away. lol. 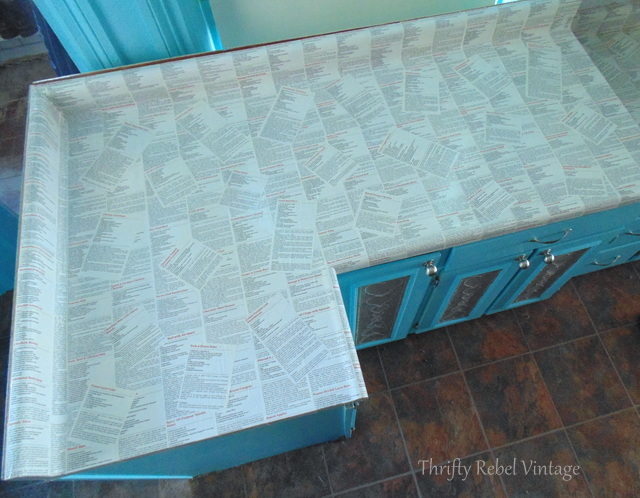 I decoupaged book pages inside of an armoire, but I never would have thought to do it on a kitchen counter. . .genius! Thanks for sharing with SYC. Thanks so much Jann! 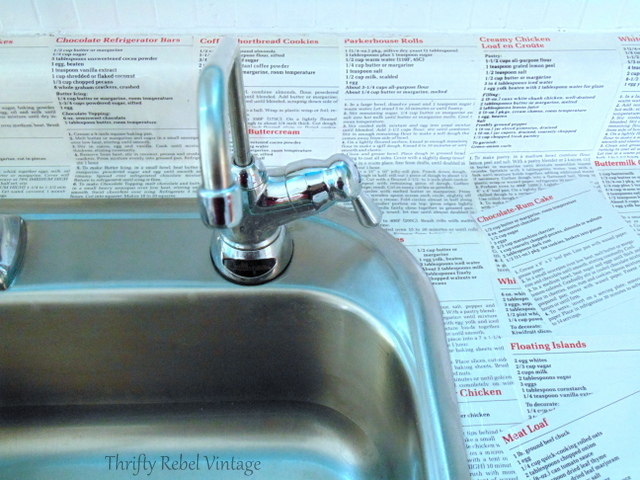 It’s amazing how easy it is to prettify almost anything with decoupage. Such an original and creative idea. Looks great with the new colors in your kitchen. Fabulous! Thanks very much Judy! It was a lot of work, but I’m really enjoying it. Love Love Love it. Just one question. 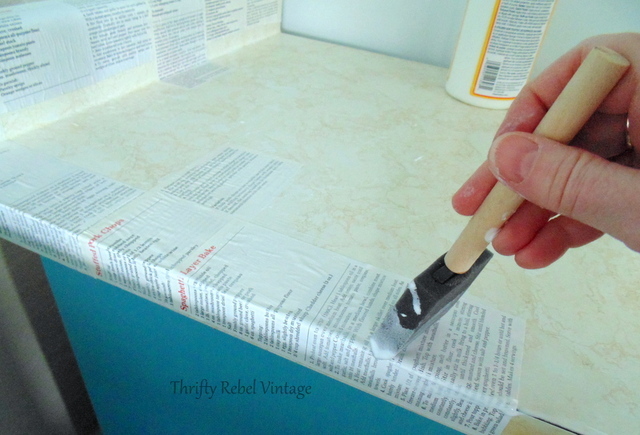 Did you sand the countertops before applying the mod podge ? I know when you paint countertops you must sand the shine off first. I look forward to seeing how they hold up. Beautiful, creative job. Thanks very much Lynda! I didn’t have to sand or do any prep except giving them a good wipe to make sure they were clean. 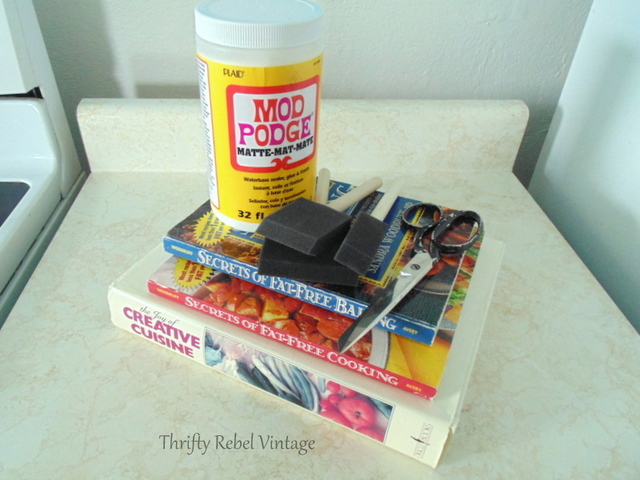 The Mod Podge is like a glue and the recipes stuck no problem. So far they are holding up great, but time will tell. The thing I love the most is that if I have a trouble spot I can easily fix it with left over recipes. Also, I’m on the lookout for another copy of that same cookbook just to have it as a back up. Not sure if I’ll need it, but you never know. I do plan on keeping my counters. What a Perfectly Great makeover! I’m glad you found a not-really-vintage cookbook to use, some of us collectors might not have been able to finish reading, lol. 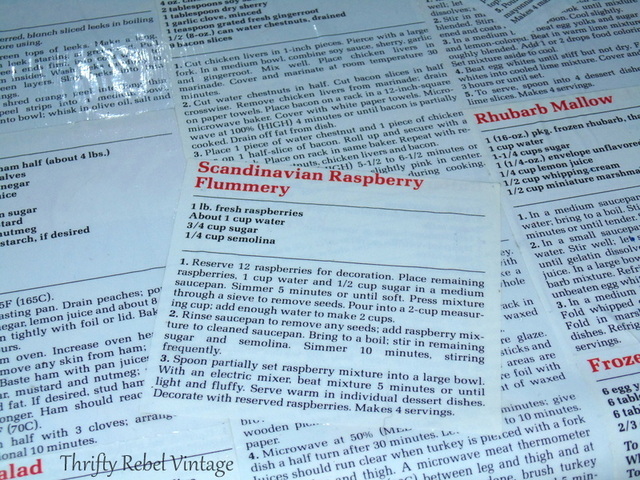 Also, ;-), next to the raspberry flummery recipe (which lol I did copy off for future use too) I can see about 2/3 of a Rhubarb Mallow recipe. We love rhubarb here, have a swath of them in the garden, freezing lots of it for the rest of the year, & I collect and use as many different recipes as possible. So… Silly request, but reading what I could see, it’s a totally new recipe to me. I ran several online searches for it, and short of finding/buying the book, it’s not posted anywheres. So… Please… uAny chance for a full picture of it? I wouldn’t ask for you to type it out for me, and it’d also be another pix of your great counter to enjoy! Thank you for posting your clear and easy to follow tutorial, It may have inspired me to do another, lol….